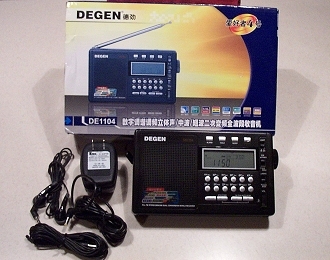 The new Degen DE1104 is an interesting addition to the line of worldband portables from Degen. It’s niche seems to be just one notch below the DE1103. You can buy the DE1104 on eBay for $38.90 plus $24.00 shipping for a grand total of $62.90, compared with $73.90 delivered for the DE1103. Since the DE1103 is widely known and has become sort of a standard of comparison at its size and price range, comparisons are inevitable. I won’t keep you in suspense…I like the DE1104…it performs well overall and it even adds a few touches you don’t get on the DE1103, but there are also a few things you give up so to some extent your tastes and listening habits will determine if it’s the best choice. for you. Degen has shown they are willing to think “out of the box” with designs that are innovative and in some cases unusual…in the case of the DE1104 I think you’ll agree they’ve made some good choices. The DE1104′s most unusual attribute is that it is PLL Tuned on FM but analog tuned on AM and SW with digital readout. SW is Dual Conversion. There is a nice-feeling knob for AM/SW tuning but FM is tuned only by stepping through the frequencies, auto scanning or using one of the 30 FM presets. There is no direct keypad input. 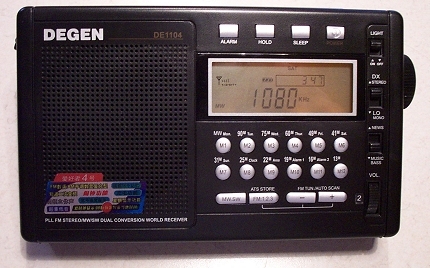 SW is divided into 11 bands and tuning is relatively non-touchy compared with some other analog tuned radios with digital displays. You can check band coverage on the eBay sites which sell the 1104 but note there is an error…there is no 11 meter band even though the Operator’s Manual and both websites list it as of this writing. The DE1104 is available with both Chinese or English lettered versions…check the websites. 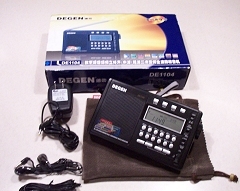 The DE1104 is an interesting new radio. In this size and price class I don’t expect top tier performance and features but Degen keeps pushing the envelope of what to expect. This radio struck me immediately with its nice rich sound. I am reminded of my first serious SW portable, the famed GrundigYB400. I no longer have that radio to compare it to but the DE1104 sounds decidedly fuller and richer than other radios in its general size range. Comparing it with my DE1103 and its upscale siblings the Eton E5/Grundig G5, the 1104 offers a warmer sound, albeit with a touch less clarity or crispness in the highs. It is a real joy on program material, and when I tuned the FM band I was struck by how real the voices sounded. Clearly this is not a true high fidelity device, but its sound actually surprised me when I first turned it on and I wanted to pass those feelings on to you. The DE1103 is a bit better at intelligibility for weak signals. Overall reception on all bands was very close to the DE1103 which is to say it is excellent. The 1104 exhibited a very slightly higher noise floor and just slightly less sensitivity, especially on AM, but comparing the two radios I have to say they were very close. A real positive is the front panel-mounted volume thumbwheel. This is so much more user friendly that the DE1103′s peculiar volume control arrangement and it’s even quicker than the dedicated Up/Down volume buttons on the E5/G5. I said that Degen has been an innovator and that’s certainly true, but as far as I’m concerned I will always prefer a regular volume control. It’s quick, easy and intuitive. Period. One negative is the FM tuning scheme…even though the DE1104 is PLL tuned on FM there is no direct keypad frequency entry as there is on the DE1103. You have to step through the frequencies and this is both tedious and time-consuming. Scanning works well, but still, if you’re at 88.1 and want to get to 107.9 you’re just not going to get there very fast. The saving grace here is the 30 FM presets – once you have them set you can jump quickly from station to station. But since there are already sufficient buttons on the front panel, why couldn’t they work for direct frequency input as well as their other functions? If FM is your major focus you may not love this arrangement. Overall tuning and operation on AM and SW were exemplary…nothing beats an analog tuner with a tuning knob. Strangely, as with many other recent Chinese offerings, tuning seems to operate backwards on the AM band but normally on SW. That is, as you turn the knob clockwise the stations go down on AM but up on SW. Admittedly a small point but nonetheless I have to wonder why. Reception was strong and selective enough to allow separation of nighttime AM signals on adjacent frequencies and the band was typically full of stations booming in. There is no Wide/Narrow bandwidth as on the DD1103 but the 1104′s one bandwidth is well chosen for its balance of selectivity and sound quality, so again, for program listening, this is a no frills radio that does it right. On SW the selectivity is good enough to allow you to separate the major signals…again, this is not a DXing machine but for general listening it does just fine. You can also use the supplied wire antenna to increase SW sensitivity further. I tested it on several frequencies and found it to be a worthwhile improvement. Note the external antenna jack does not function for AM on the DE1104 (nor does it on the 1103, although interestingly it does on the E5/G5). I also really like the manual light switch. It is a simple On/Off mechanical toggle switch and stays on or off as you choose. The manual states that current consumption is low enough that you can leave it on without worrying about running the batteries down…I can’t confirm that claim. Just be sure you don’t leave it on when you are done listening for the day or you certainly will shorten battery life. A minor annoyance is that the auxiliary antenna jack is slightly recessed next to a ridge on the side of the unit which means that several of my antenna adapter plugs would not seat fully into it. As I said at the beginning I like this new DE1104. As a slightly less expensive radio than the DE1103 and considerably less expensive than the Eton E5/Grundig G5 twins, it gives up direct keypad entry, SSB reception, dual bandwidths and continuous coverage on SW. It is so slightly less sensitive it’s almost not worth mentioning but if you want to use the radio to dig out the weakest of signals the DE1103/E5/G5 are just a tad better at that. 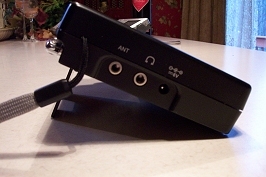 On the plus side it seems solid and has a nice feel, it offers warm and full sound quality and the ergonomics of a real volume control, analog tuning on AM and SW and RF performance that is very close to the DE1103, including Dual Conversion and digital readout on all bands – it is a very pleasant band-scanning radio. As an alternative to the DE1103, or an inexpensive traveling companion, I think it’s worth taking a look at the Degen DE1104… it is a good value at its price.